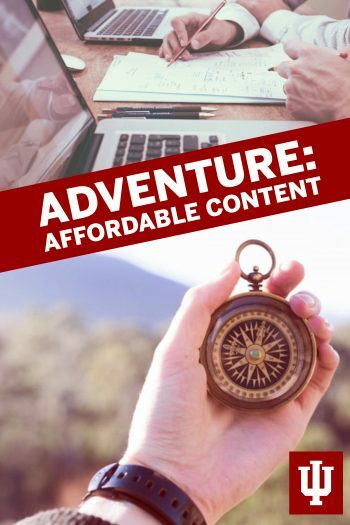 Book Description: Adventure: Affordable Content will take you on a journey through your options for delivering affordable digital textbook content at IU. The adventure is yours to control: make decisions, review resources, and find out which affordable content will work best for you! Cover photos provided by Helloquence (top) and Heidi Sandstrom (bottom) on Unsplash. Adventure: Affordable Content by Emily Hunt is licensed under a Creative Commons Attribution 4.0 International License, except where otherwise noted.